Asset allocation stands for a plan for your hard-earned wealth to meet your goals. I often get a hard stare when I use this term, so let me give you an example. Imagine you are the pilot of an aircraft and have to fly to London from Mumbai. There are two options. You can take off without checking the weather or planning the route, taking it as it comes. Or you can chart a route with the help of air traffic control, check the weather reports throughout the journey to avoid turbulence, and keep monitoring the flight at regular intervals—all so that you land safely. Asset allocation does exactly that, to your existing and future investments. This is a frequent pushback I get from investors, especially when they have sufficient earnings and wealth. Most of us feel we have more than our present needs—so why bother? There is also a general fear or lack of confidence in ‘disturbing’ existing investments owing to lack of knowledge. This is the myth I wish to destroy in this article. Over the course of our productive lives, we earn and save and/or inherit assets, including property, shares, cash, jewellery, etc. The sum total of this is ‘our wealth’. Readers may recollect that I always believe that this is ‘our bread earner’ or ‘third child’! Assets in general have earning power but they all carry different levels of risk. Generally speaking, the higher the risk, the higher the return. Hence, it is always a good idea to ‘put your eggs’ in different baskets as the wise saying goes. Asset allocation enables you to do precisely that. To start with, it allows us to take stock of our wealth. Depending on our age, we can decide our future goals, including wealth transfer after death. It allows us to firmly set a limit to the risk we are willing to take. It prevents a potential mismatch of our goals versus investments. It sets a reasonable expectation of future returns. I firmly believe in (and practise) the mantra of asset allocation for my clients. 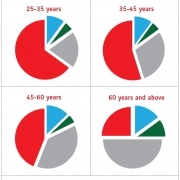 One of the factors to closely evaluate before we allocate their wealth is their age profile. This is the most important factor in planning. 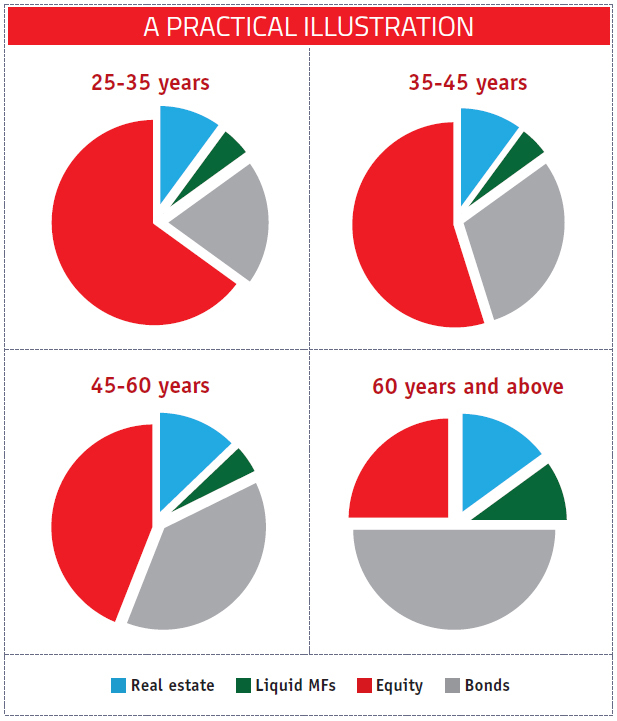 The charts above indicate what different persons can target as ideal asset allocation. Remember, there is no single glove that fits all, even within the age groups, just a broad guide. Be absolutely clear on how much you need as regular income and at what frequency; i.e. monthly or quarterly or annually. Decide how much investment is needed in low-risk instruments to meet the above need. Decide the level of risk you are comfortable with. Collate all your holdings, including property, cash, mutual funds, life policy values, shares, deposits and bonds, into a single sheet. Evaluate the above if it is ideal to your goals—contact us or your financial advisor if you are not clear. Via active consultation, finalise an asset allocation plan you are comfortable with. Most important, once this exercise is done, make sure you and your financial advisor implement it and stick to the plan. We hope this article has thrown some light on a very relevant topic. At Ethical Advisers, we firmly believe investments should be based on well-researched facts and deep knowledge, not rumours. We welcome any questions you may have on this or other topics related to long-term investing—feel free to write in.